فرودگاه بین‌المللی مک‌دونالد-کارتیر اتاوا (به انگلیسی: Ottawa Macdonald-Cartier International Airport) یک فرودگاه همگانی باربری با کد یاتا YOW است که یک باند فرود آسفالت دارد و طول باند آن ۱۰۰۶ متر است. این فرودگاه در شهر اتاوا کشور کانادا قرار دارد و در ارتفاع ۱۱۴ متری از سطح دریا واقع شده‌است. 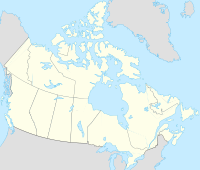 Macdonald–Cartier Airport is part of Canada's busiest air corridor between Ottawa, Montreal, and Toronto, which is commonly referred to as the Eastern Triangle. The airport is also a gateway for flights to the eastern Arctic via ایکالویت. While Ottawa's airport serves many major North American airlines and has flights to Europe, and several cities in the United States, Ottawa is the largest metropolitan area of Canada which is not a قطب شرکت هواپیمایی for any airline. ↑ "Battle Heats up over Triangle Business Passengers". Thestar.com. 2009-08-08. Retrieved 2011-02-23. ↑ "Air Canada / rouge W17 Mexico/Caribbean changes". routesonline. 2017-07-02. ↑ "airtransat adds new nonstop sectors for W17". Routes Online. ۱۷ مه ۲۰۱۷. Retrieved ۱۷ مه ۲۰۱۷. ↑ ۴٫۰ ۴٫۱ "Fredericton, Saint John airports land Porter Airlines service to Ottawa, Toronto". CBC News. 2017-06-26. این صفحه آخرین‌بار در ‏۱۹ نوامبر ۲۰۱۸ ساعت ‏۱۵:۴۰ ویرایش شده‌است.